Borough Market Grilled Cheese Toastie Recipe - Say "Cheese!" Having returned from our London / Scotland holiday (trip report here), we were in the mood for the delicious Cheese Toastie we devoured at the Kappacasein Stall at the Borough Market in London on a previous trip. 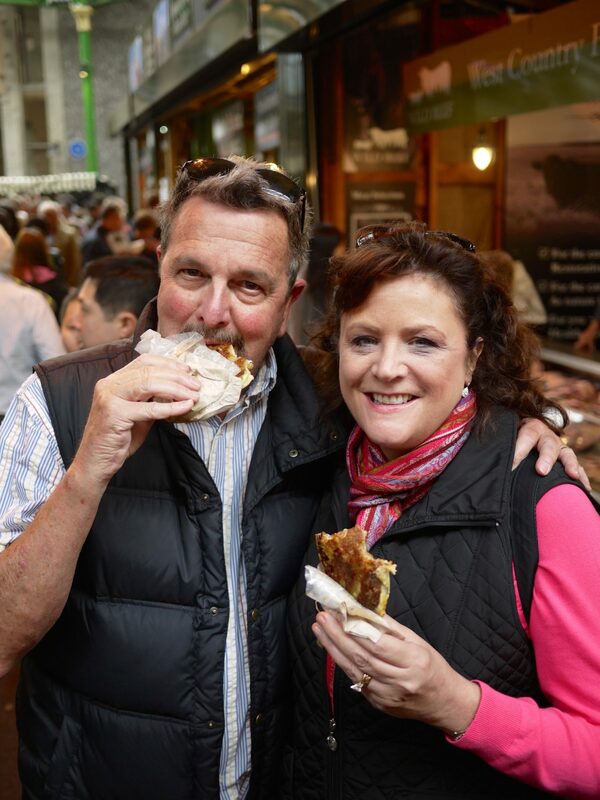 We tried this sandwich on our first excursion to London in 2013. Tom liked it more than I did, but I changed my mind after eating it again last month. 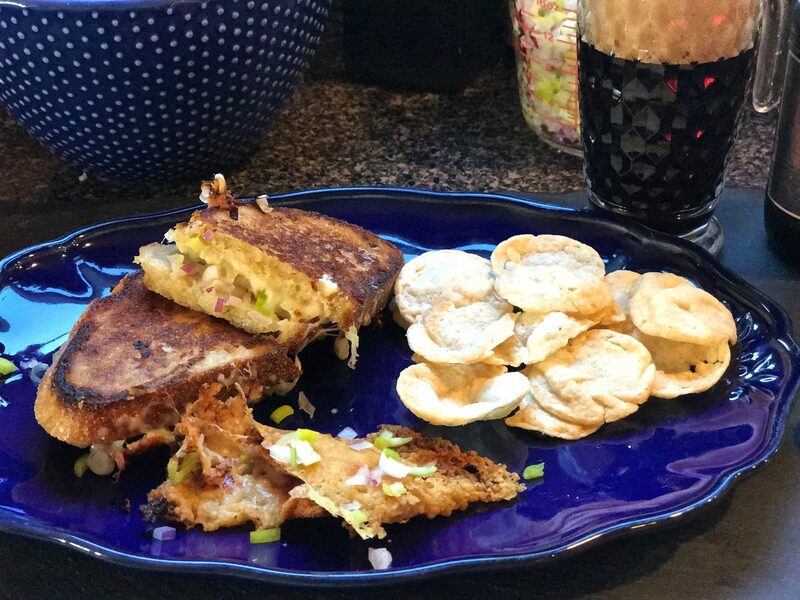 Biting into the crunchy, toasted cheese goodness, I realized the addition of leeks and onions made for sheer perfection. As you can see, Tom’s eating manners have not improved in the past four years. 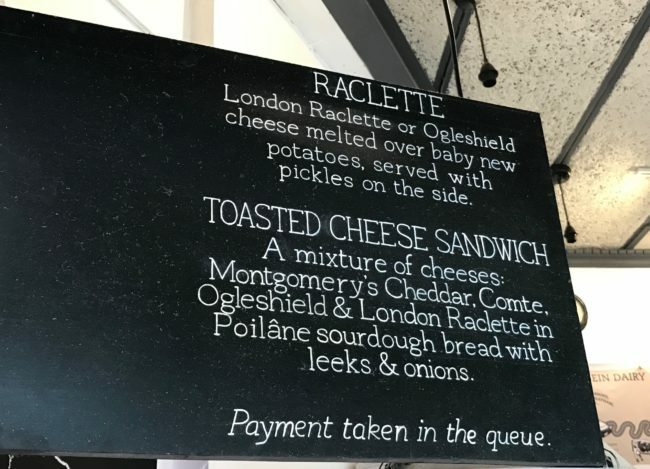 says the sandwich is made with a combination of Montgomery’s Cheddar, Comté, along with Ogleshield & London raclette cheeses on Poilâne sourdough bread. 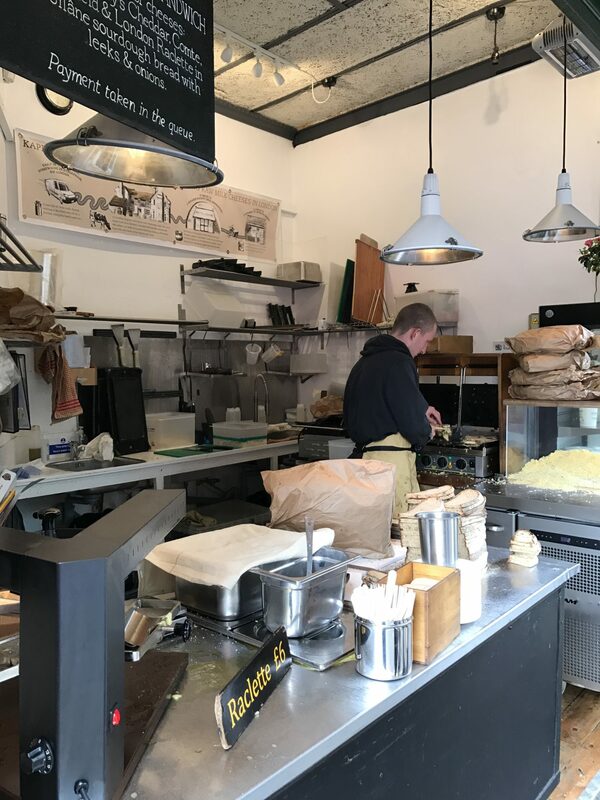 Poilâne is a famous boulangerie in Paris that, of course, doesn’t have a branch in Southern California. Instead, I used sourdough from Whole Foods. 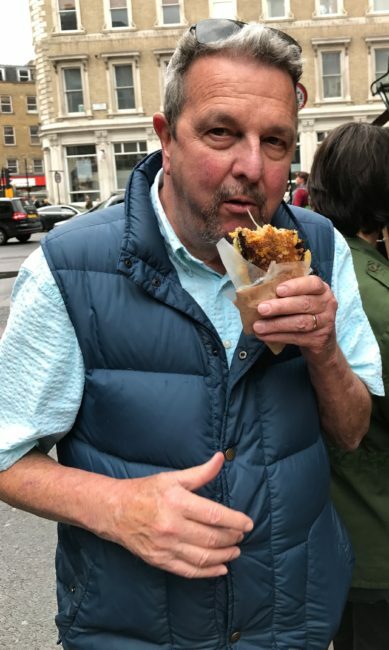 My trip to a nearby Trader Joe’s also netted an English cheddar, and the Comté cheese. Raclette is similar to Gruyère, so I picked up a chunk of that too. Although I could not find the exact recipe, a little online research revealed that Kappacasein usually uses a combination of five, finely chopped alliums. 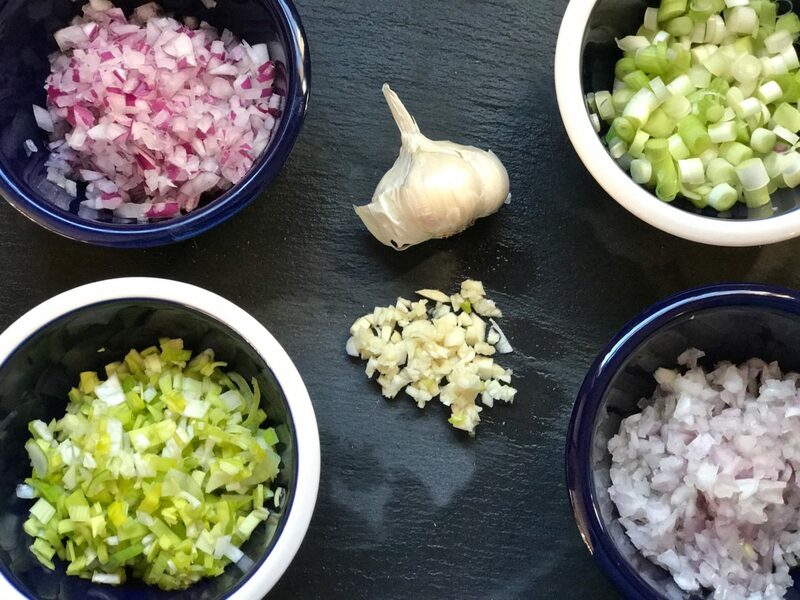 I did read that the combination always includes at least red onions, leeks, and garlic. Next, to sauté or not sauté? 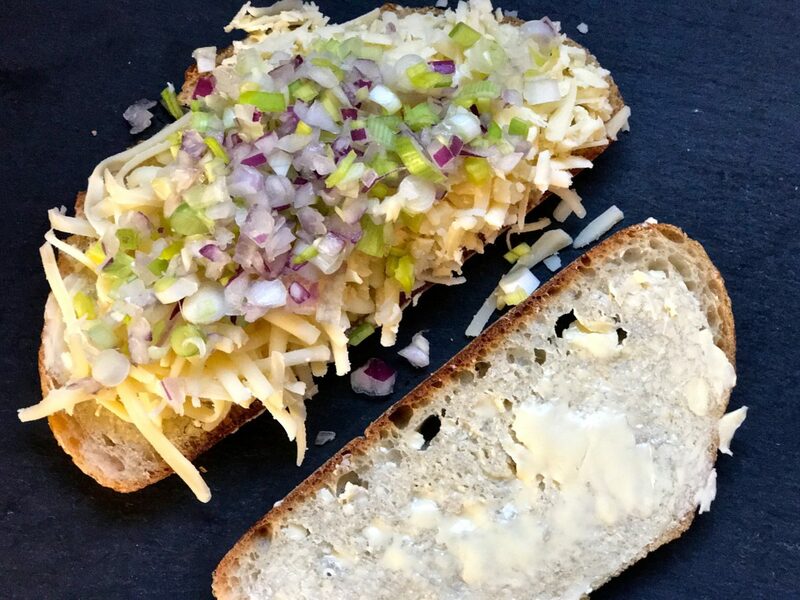 The first time I tried this sandwich, I sautéed a combination of leeks, garlic and green onions with a pinch of herbs de Provence which was really good. 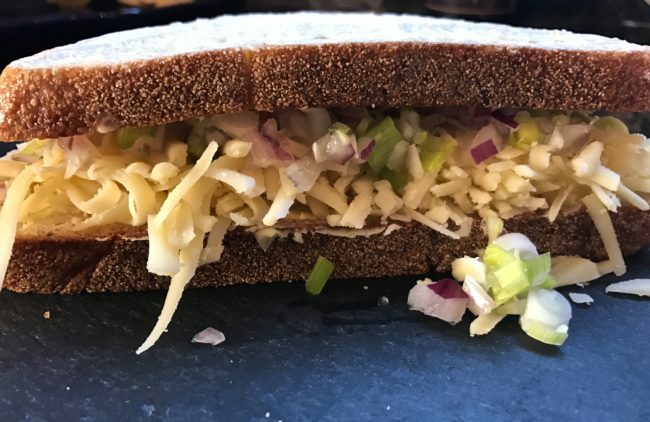 However, after doing the research above, it seems that Kappacasein does not sauté their onion mixture which makes sense given the amount of sandwiches they sell in a day. Last, but not least, how to obtain that perfect crunchiness? I believe the secret is French mayonnaise on the outside of the sandwich and butter on the inside. Mayonnaise has a higher tolerance for burning, and French mayonnaise contains mustard for an added touch of spiciness. If you can’t find French mayonnaise, regular mayonnaise will work, too. 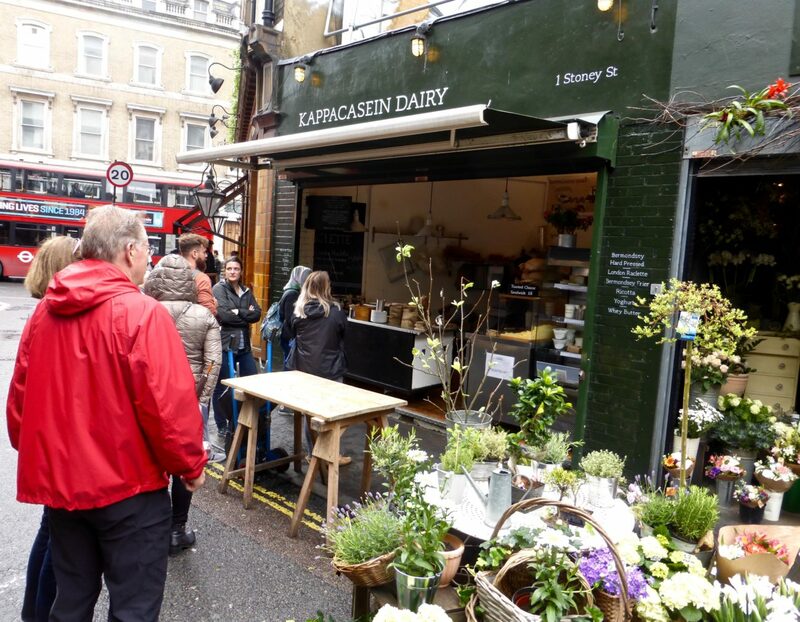 Kappacasein uses a press for their cheese toasties. I fried mine in a non-stick frying pan (we don’t own a “toastie” press). If you are making more than one sandwich at a time, try a non-stick electric griddle. 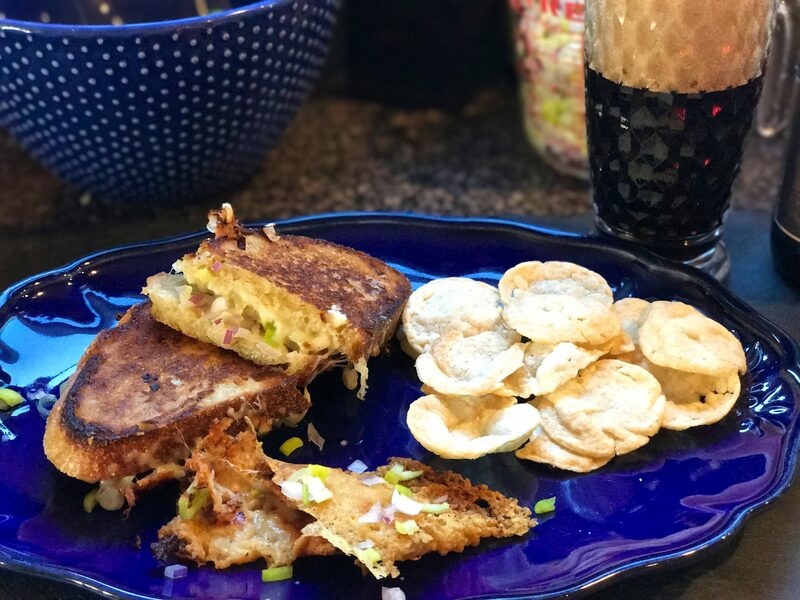 A strict connoisseur might call it a “grilled cheese,” but it’s all in the ingredients and taste, so we’ll stick to “toastie.” Maybe that will be a future purchase. Add an ice-cold brew (or a Pimm’s Cup like Tom tried in London) and crisps (that’s Brit-speak for potato chips), and you have the perfect meal for lunch or dinner. 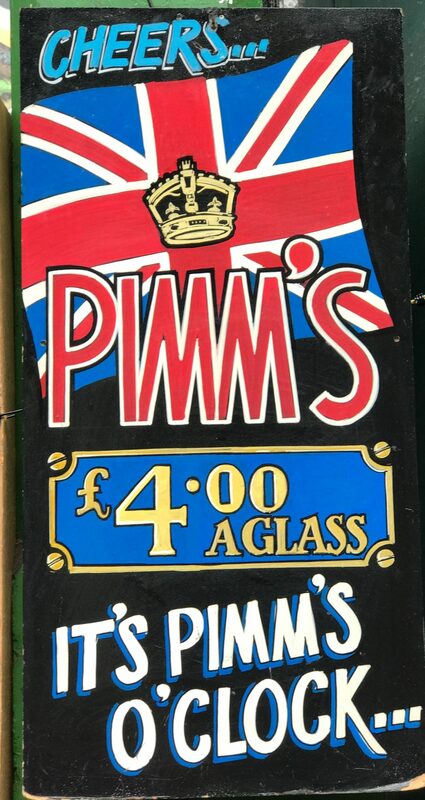 So let’s raise a toast to the toastie! 4-6 servings depending on how much you can pile onto your sandwich. 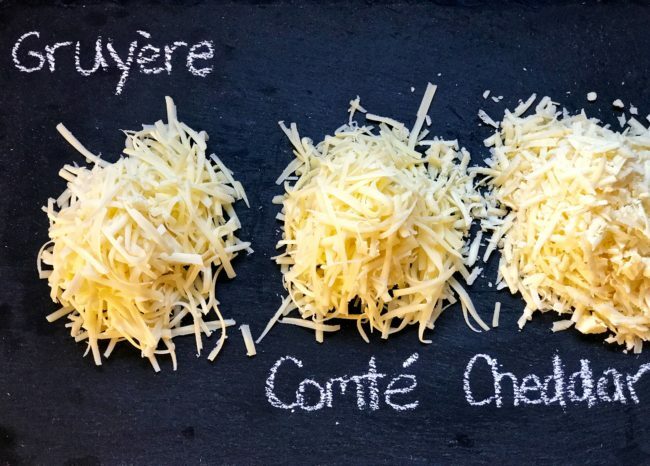 Grate the cheeses and combine in a bowl. Toss the finely chopped onion mixture together in a small bowl and set aside. To assemble the sandwich, butter two slices of bread, top the buttered side of the bread with about 3 T. of the cheese combination and 2 T. of onion mixture. The exact amount will depend on the size of your bread slices, just be sure to completely cover the bread from side to side with a good amount of cheese and onions. Remember, more cheese is better than less cheese! Press the slices together and then brush the outside of one slice of bread with mayonnaise. You will brush the other side of the sandwich once it is in the pan. Melt 1 T. of butter in a non-stick skillet until good and hot. Add the sandwich mayo side down. Brush the top of the sandwich with mayo and brown about 3 minutes until the bottom side is golden brown. 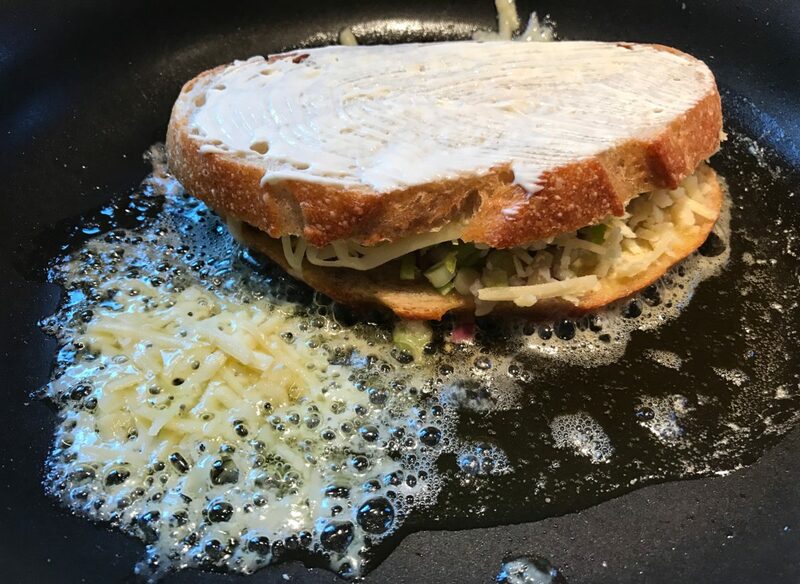 Flip the sandwich and press down with a spatula on the sandwich occasionally, until the outside is golden and the cheese is melted. About 3 more minutes. Add extra butter if needed. 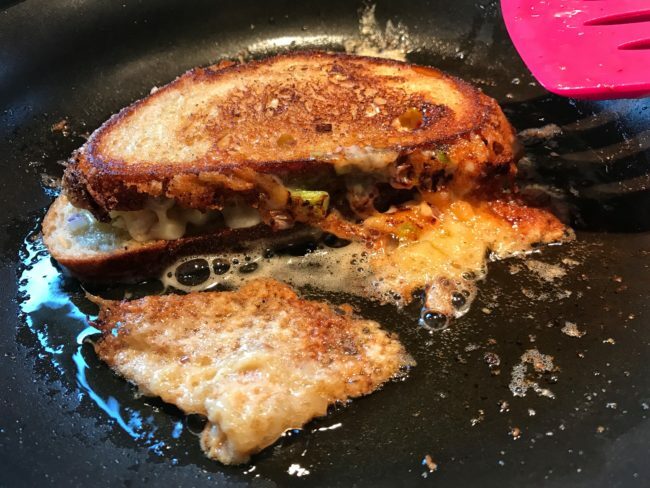 I also tossed a couple of pinches of cheese into the pan to melt and brown up alongside the sandwich. 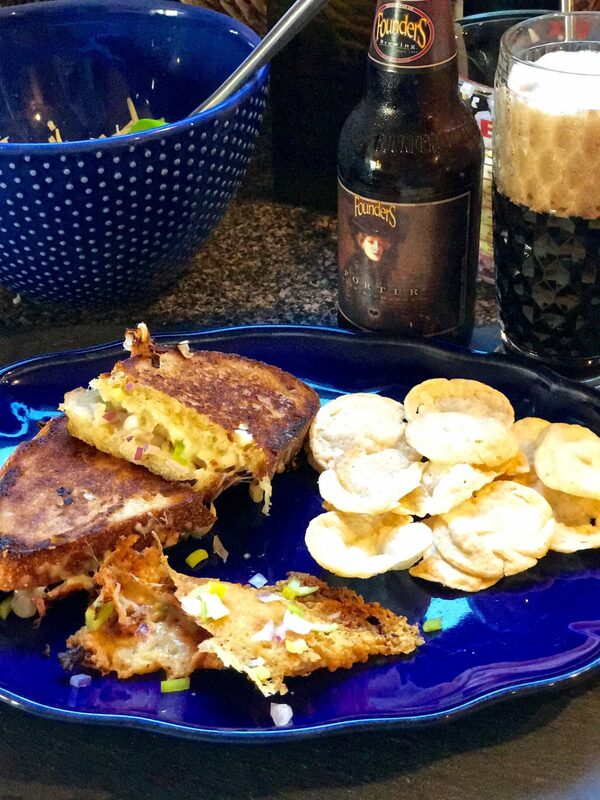 Burnt cheese … good stuff! 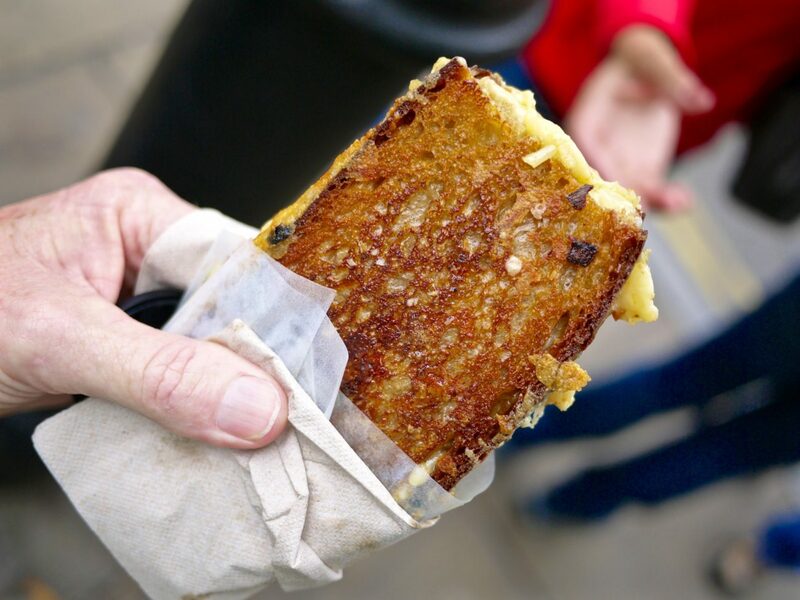 …as a special occasion cheese toastie, this one can’t be beat. Cheerio!